Today we discover the 7 best design tips for modern small offices ... so that space is NOT the problem when it comes to setting up your office! Office space is increasingly scarce, both at home and at work, so you have to learn to make the most of the available meters and get them a good performance. 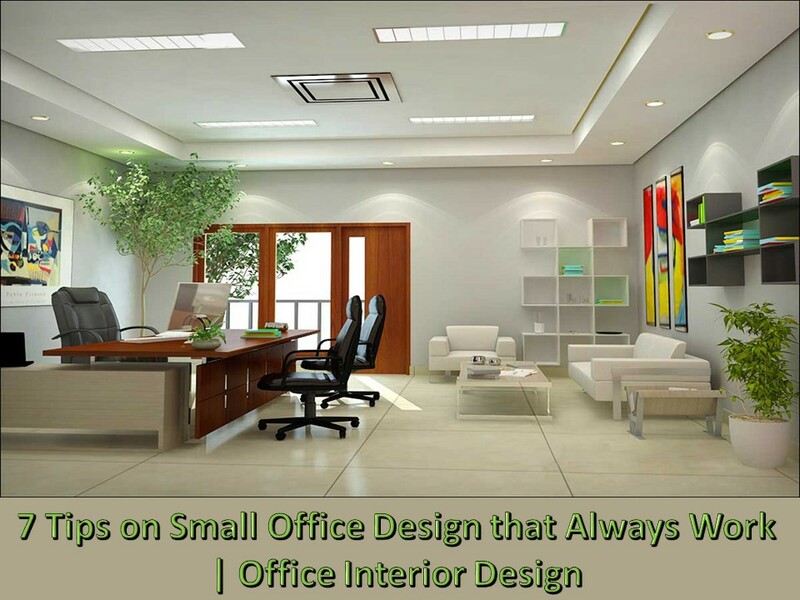 For this we will see some tips that can help us when designing a small office but where we have everything necessary at hand. And more importantly ... a sense of spaciousness and well-being that invites work and concentration. Because you have to think about everything! The color used correctly can help us visually expand the space or on the contrary, subtract meters. The simplest option is to choose light and bright colors that help you give a greater sense of spaciousness. The whites, creams, stones and yellows are ideal colors to make any space grow before our eyes. But you can also opt for pastel tones such as green, pink or lilac always in very soft tones, nothing strident. Everything will depend on the available space, but in case of doubt ... the tone goes down! The roof is another element that we can use to our advantage. If we paint it white or the same color as the rest of the walls, we will gain meters. We can also help with the use of moldings or borders that are placed near the ceiling and create the feeling of greater height of the walls. No detail should be left to chance! The color unit of the entire space also helps, especially with white or lighter shades. But a color that we can also use to move the walls away is light blue. The blue reminds us of the sky, the sea and the open spaces so the whole office (even if it is small) in that tone will give a feeling of spaciousness and freedom of movement. Do you dare to try it? Finally, if we want to gain depth, a good idea is to paint the wall opposite the entrance with a darker color. If for example we are using yellow tones that wall can go in a higher tone of yellow or if we use gray or white that wall can go in an anthracite tone. In this way, it will stand out and give a feeling of being deeper. And if you have a bookshelf on that wall bet on painting the background of it dark and the impression will be that it is much deeper. Light is key in decoration but if it is about winning meters ... even more! Let the light invade everything. No heavy curtains bets for the clearest and transparent and give the maximum possible prominence to your windows, what between the light streaming! Placing the table under the window is always a good idea. We lighten the center of objects and also give prominence to the windows, where all eyes will go when entering. But if you do not have windows, be sure to put a lot of light so that the luminosity invades everything. Use different types of lights: ceiling, standing and some auxiliary on the desk, to be as white as possible. Light is key in the battle for space! The space we have will be wider if we do not overload it. Here minimalism should be our motto. The minimum possible furniture and always to be able to be nothing heavy or with too dark tones. It is therefore better to bet on the lighter visually such as glass or metals. Tables with thin metal legs or glass that help to let the view go through and give depth. Thin panels and in light colors to be able to be confused with the walls. The straight lines are perfect for small spaces as they do not overload. Or the transparent plastic chairs or metal skate-type legs. It is also important to eliminate from our space everything that is not necessary to achieve even more space and stay with what is really useful. The goal is to let the view go by to gain meters! Another good idea is to unify in color furniture and walls so that the furniture is lost in the wall and the feeling of continuity is greater. White is undoubtedly the best option to achieve this goal. Try it and the space of your office will expand before your eyes! Small changes like this can be crucial in the design of small offices. 5. Objective: Everything in order! Everything in its place and well ordered will help us so that the space does not fall on us and it seems much more diaphanous and ample. For this, it is best to reduce the necessary objects as much as possible and to clean them periodically, eliminating all the superfluous items that we have not used in recent months. At the work table, better only the essential. But also help us with drawers and low cabinets, shelves on the wall and everything that can help us gain space but without being heavy. The loose shelves in the wall can be a great option but use boxes or containers so that everything appears in order. And if the objects are of small size even better because the feeling will be that the space is much larger. No big furniture or too heavy and huge objects that eat space. And all very neat ... the feeling of space and peace will be perfect! Before saying that you have no space, check every corner of the house or office well because perhaps in that small space ... there will be the solution to win a table or a shelf or a cabinet that is your salvation to have more storage. The mood boards, for example, help us to visualize well all the tasks that we have aimed and how they go on the wall, occupy little and take advantage of the space very well. Today we find many pieces of furniture designed to take advantage of the corners and passage areas and thus make the most of them that are especially useful in the design of small and modern offices. The use of cabinets, shelves and counters to divide spaces gives incredible results. In addition, if we combine it with bright colors and an adequate use of light we can achieve a space of enjoyment. So, first of all, look with an open mind at every available space ... and you'll probably be surprised!